Acclaimed author Lady Antonia Fraser DBE has donated £500 to Hackney Community Law Centre (HCLC) on behalf of her late husband Harold Pinter. Pinter, famous for penning plays including The Birthday Party and Betrayal, was born in the borough and went to Hackney Downs School, where he was encouraged to write by an inspirational English teacher. He went on to win the prestigious Nobel Prize for Literature in 2005, three years before his death at the age of 78. 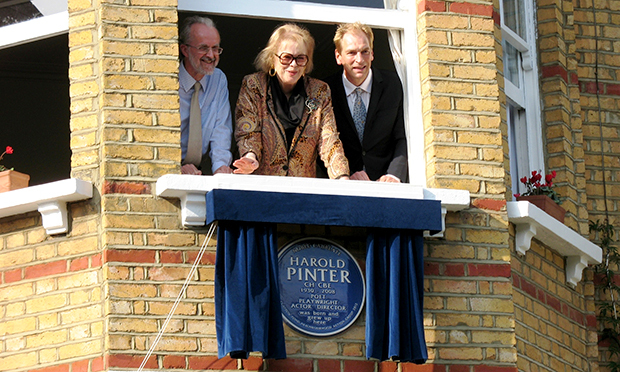 In 2012, HCLC chairman and local councillor Ian Rathbone organised for a commemorative blue plaque to be placed on the Thistlewaite Road home where Pinter grew up. Lady Fraser, an award-winning writer herself, said: “When I heard about the work of the Hackney Community Law Centre, I immediately decided to give a donation in the name of my late husband Harold Pinter, who was born and brought up in Hackney. HCLC provides free access to legal advice for people living, studying or working in the borough, and Rathbone welcomed Lady Fraser’s “encouraging gesture”. He said: “Harold Pinter’s first success as a playwright depended on his unique understanding of working class and poor people, what their lives were like and how they spoke, which is reflected in many of his plays and he would have understood the needs for such people to have free access to justice, which is the focus of HCLC. “He was also born and schooled in Hackney, and so it is appropriate that Lady Antonia, his widow, has made this generous donation to the law centre in Hackney in his memory. For more information about Hackney Community Law Centre, please visit its website here.